The U.S. penny, or one-cent, was made of copper mid-way 1982 and older. Since the switch over occurred during the year 1982, the only safe way to know if your penny is copper is if the date is 1981 or older. The copper penny is 95% copper and there are approximately 147 copper pennies per pound. While the present day penny is a zinc penny is made of 97.5% zinc and 2.5% copper. The back of the copper penny, also known as the tail side or reverse, is commonly the Memorial design. The Memorial design began being minted in 1959. Prior to that, the U.S. penny, known as the wheat cent, had wheat ears on the back and the words, ‘One Cent’ in big font. Many people collect copper memorial pennies because of their metal value in copper being of greater worth than the actual face value (the weight in copper is worth more than the amount one penny is worth as spending money). So even though the traditional answer for what year the penny was made of copper by looking at the date is 1982, the only way to know for sure is to hoard 1981 pennies and older. The copper pennies available to buy in bulk here include 1982 due to advance sorting techniques. 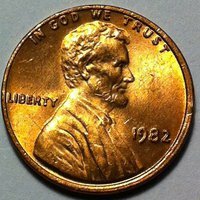 Note there are very rare pennies minted in 1983 that are copper which were made in error. These are incredibly difficult to find. There are also various experimental pennies that made it into circulation of other metals and compositions.